ABOVE: The parish church and manor house of Santa Cruz de Rivadulla. 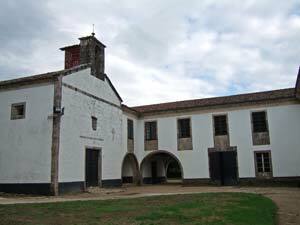 Not far from the Pazo de Oca is the Pazo Santa Cruz de Rivadulla, sometimes referred to as "Granja de Ortigueira." The property dates back to the 1500s, and today's white stuccoed buildings were mostly constructed in the mid-1700s. My advice: If you have time for just one garden excursion from Santiago de Compostela, visit the Pazo de Oca; if you can spare an extra hour and another few euros, stop at Santa Cruz de Rivadulla on your way back to the city. For more information, including ticket prices and visiting hours, visit the Pazo de Rivadulla Web site.